← Fabric Shopping in Yorkshire! I’ve just had a lovely day walking round Bolton Abbey with a couple of friends. We wanted a walk that wasn’t too strenuous, potential for autumn colour and a choice of tea shops!! Bolton Abbey fitted the bill perfectly! We’re only about half an hour from Bolton Abbey, it’s an estate owned by the Duke of Devonshire (of Chatsworth) but its origins go back to the 12th century. It was an Augustinian monastary built on the banks of the river Wharfe and I gather it was was still unfinished when Henry V111 fell out with the Catholic church and started the dissolution of the monasteries around 1540. The ruins remain but the nave of the church was restored and a roof put on so it is still used to this day for services and weddings. It’s a beautiful and peaceful valley for walking on a sunny autumn afternoon, have to admit we chickened out of the stepping stones, there’s a perfectly good footbridge right next to them! The trees are just starting to turn here, the colours were lovely. The woods had that rich peaty autumn smell too. The leaves were crunchy underfoot, a perfect autumn walk really, finished off with a cup of tea at the Cavandish Pavillion. Prior Moone was the last Prior at Bolton Priory at the time of the Dissolution, he settled in the area afterwards. Another family in the area were the Hey’s, there was friendly rivalry between the two families with each trying to rank higher in the district, causing great amusement to the locals. The Hey family are said to have diddled (swindled) the Moone’s of some livestock, namely cattle. The cat and the fiddle was an irreverent term used for the Catholic faith from ‘Cato Fidelis’ which means faithful of Christ and the Church. The locals found this all very amusing, there are still three carved dogs, one of them laughing, on the tower at Bolton which Moone had built. 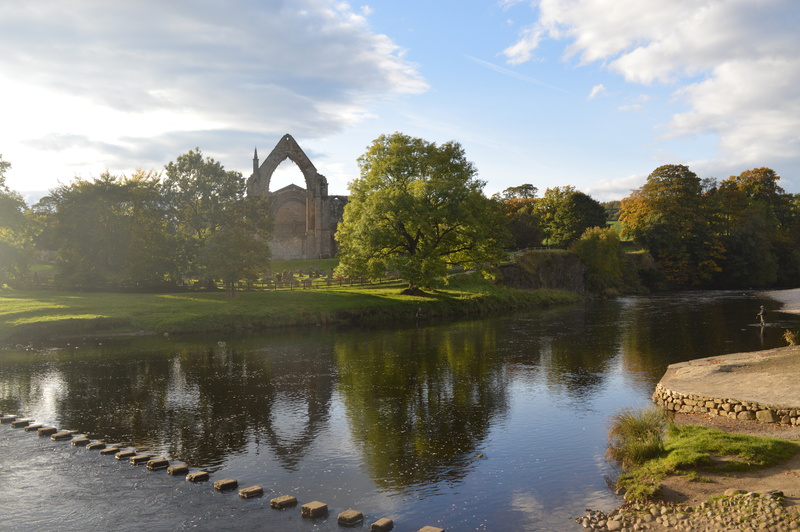 This entry was posted in Serendipity, Walking and tagged Bolton Abbey, Yorkshire walks. Bookmark the permalink. Fun times. Lovely pictures. Let’s go again soon. Thanks Kathy, definitely up for another walk! I love Bolton Abbey, but next time do the stepping stones! Lovely Autumnal photographs. Such gorgeous photos – thank you!! Beautiful photos! You’re so lucky to have a place like that so close to home. Looking forward to seeing more of your wanderings, and will check out the rest of your blog. Cheers! Lovely pictures, I’ve been to Bolton Abbey many times, as we’re not far and love walking but I’ve never heard the Hey-diddle -diddle tale – one to impress the walking group with next time! A bit if localish history I never knew. It’s a stunning walk along the river, we wear in the summer but unfortunavH didn’t appreciate it as he had to carry his foot ball most of the way so it didn’t go dish into the river.